Product: Mashers Era 150ml Clear Plastic Square Dessert Serving Cups – Packs of 50 was added to cart. Perfectly sized for serving miniature desserts, dipping sauces, finger foods and snacks, Mashers 150ml Disposable Plastic Serving Cups will make a stylish addition to any birthday party, wedding reception, cocktail function or corporate event. 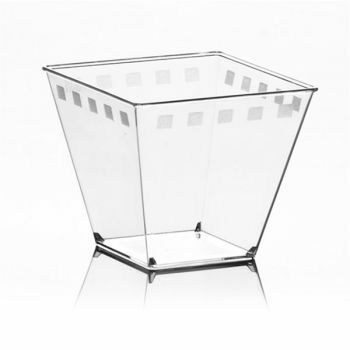 Made from durable clear plastic, these square shaped dessert bowls are washable, reusable, and fully stackable to save space when not in use. Each disposable bowl can hold a serving of up to 150ml, and they are available to purchase in packs of 50 or 400 for wholesale bulk orders.